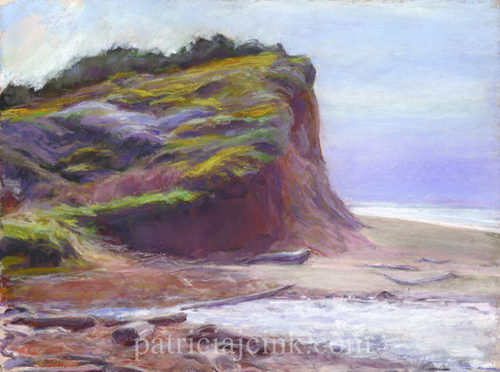 This was painted plein air at the cliff at Seven Devil State Recreation Site near Bandon, Oregon. The gorse on the cliff was striking with its yellow blooms even in the slight ocean haze. Painting plein air gives me a chance to feel the atmosphere as it works its way into the painting. People in Bandon hate gorse. It was introduced by Lord Bennett, one of the city’s founders to stabilize the sand. It does that well, but it also is a horrible thorny weed that is very oily and combustible. It was a major contributor to the 1936 fire that destroyed most of the city of Bandon, Oregon.